This is my fourth “go” at the Hartford Stage’s traditional production of Charles Dickens’ famed yuletide classic A Christmas Carol—now celebrating its 20th anniversary, having debuted in 1998, adapted and directed by Michael Wilson. That’s a lot of Christmases past, indeed. I saw two productions with Bill Raymond as Scrooge, and this is my second time seeing Michael Preston in the role, and the third time with Rachel Alderman as director. And you know what? I think it’s the best version I’ve yet seen. Not sure why that is, since most of the cast is identical with last year, and the staging has not varied much in the four years I attended. This time, though, there seemed more gravitas to the whole. It could be that I’ve simply got beyond the warm haze of familiarity and am seeing the show not in comparison to the various Christmas Carols that have gone before, but as something in its own right. Or rite. As a ritual enactment, the Hartford Stage version has much to recommend it. It’s moving, and it moves. The show boasts a wide-open set, with entrances from every direction, and has a second story that adds much visual interest. And there are skeletal ghosts—some even fly—that create a feel for how haunted is this story of a mean-spirited old miser. They’re fun but can also be a bit unnerving. Preston’s Scrooge, even when he’s at his worst, tends to feel a bit sympathetic because we see how he’s beset by his own bluster. Scrooge, as we learn, was once much more of a softie, but some hard knocks—a very unaccommodating father and the loss of his beloved sister, for starters—and some bad choices, like letting the love of his life get away, have made for a very testy middle-age. He also prizes his fortune as something that’s for him to hoard and for others to do without. That’s the part that really needs a make-over. The supporting cast—many in more than one role—have had time to make these roles their own. That includes, of course, Noble Shropshire, who delights as the air-borne and woebegone ghost of Marley, and as the doting Mrs. Dilber, Scrooge’s housekeeper, and Robert Hannon Davis’ dignified Bob Cratchit, and Terrell Donnell Sledge, who provides a welcome focus in the early second act as Scrooge’s warmly effusive Nephew, Fred. As Belle, Scrooge’s one-time fiancée, Vanessa R. Butler plays well the heartstring-tugging of Scrooge’s big loss, a break that she treats as a sacrifice on her part. The three debtors who transform into the spirits that haunt Scrooge’s uneasy slumbers on Christmas Eve are all top notch, both as street vendors and as ghosts. Bettye Pidgeon (Rebekah Jones), a doll vendor, Bert (Alan Rust), a fruit and cider vendor, and Mr. Marvel (John-Andrew Morrison), a watchworks vendor, already feel like familiar characters, and the three introduce some welcome comedy at Scrooge’s expense. This year, I think the rebukes aimed at Scrooge by the spirits landed with a bit more force—maybe the travails of 2018 make even Christmas spirits less patient with pig-headed old fools like Scrooge. As Christmases Past, Rebekah Jones telling Scrooge not to blame her for the mistakes of his youth, and, as Christmases Present, Alan Rust’s use of Scrooge’s own callous words against him certainly come across as the dire lessons they’re meant to be. 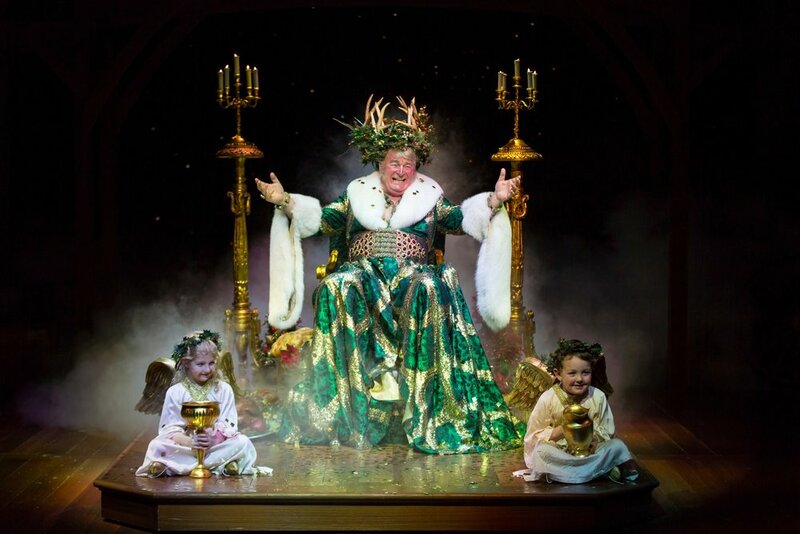 For all their cheeriness as ambassadors of Christmas, the spirits have to shock Scrooge into examining his life. And Preston’s Scrooge is every bit as fearful and repentant as he should be when the baleful Spirit of Christmases Yet to Come shows up. This year, I saw the show with some viewers who never saw A Christmas Carol before—in any form, I believe—and that fact made me attend a bit more anxiously. Certainly I wanted their experience of this great story to be memorable—as any first viewing of it should be—and I’m very pleased to say that, trying to make myself follow the story as if I didn’t already know it, I was thoroughly caught up and found the Hartford Stage version wonderfully faithful to the spirit of Dickens. I admired again how the script keeps much of his quaint but vivid language in play, as it should—such as the bit about the doornail and the Victorian fussiness with statements of sentiment. 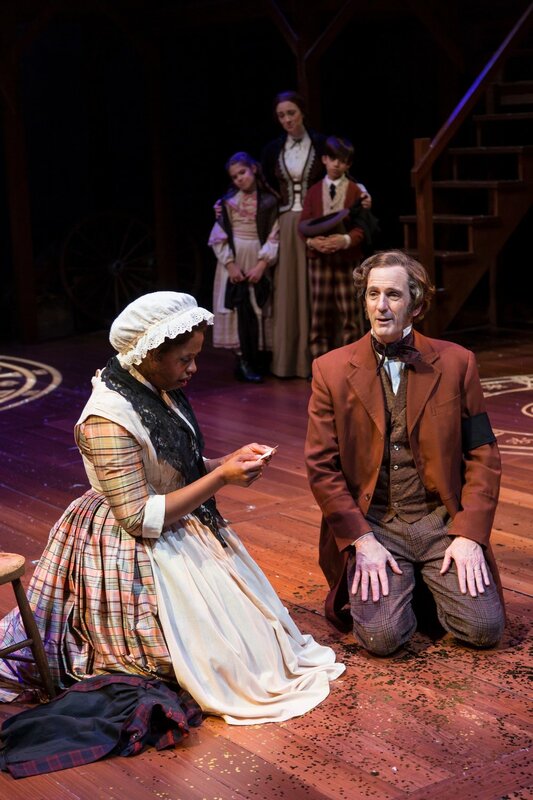 It’s hard to imagine, for instance, how the dialogue at the Cratchits, in a scene from the possible future, could be improved upon, made effective by the way Davis and Shauna Miles, as Mrs. Cratchit, underplay their grief for the children’s sake. As Cratchit reminds Scrooge early on, Christmas Day comes but once a year. True, but it comes round every year. Whatever significance one attaches to the fact of the day and its long tradition, A Christmas Carol attests to the notion that we could all do much better in treating others—whether strangers, co-workers, employees, or relatives—humanely, and that, as we close in on the date when we change the old calendar for the new, many of us would do well to turn over a new leaf. How one nasty man becomes generous and open with others is a tale worth seeing, and seeing done well. Hartford Stage’s production delivers comfort and joy.